This is a follow-up article to Home Peritoneal Dialysis: a BPMN model and use of 5S principles  – suggest you read the reference first for some background. 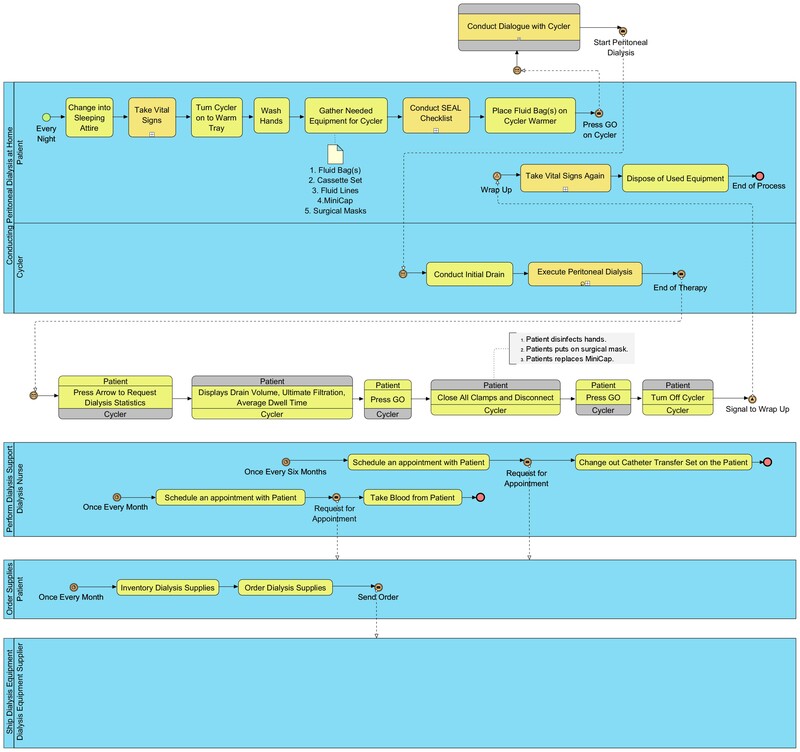 The purpose of this article is to show the expansion of an existing Business Process Model and Notation (BPMN) model due to an increased interest in a partner’s processes. In a previous Modern Analyst article , I developed a BPMN model on a home medical process associated with peritoneal dialysis. In that article, I modeled a process, Ship Dialysis Equipment, as a black box pool; I felt at the time that understanding the details of the shipper’s internal process was unnecessary for understanding the current process (AS-IS) since my focus was on the patient process. However, when the pool’s swim lane actor, Dialysis Equipment Supplier, failed to deliver on commitments, I returned to the model to expand the black box pool to develop an orchestration (pool’s internal process) thus making it a white box pool. As stated in the reference , peritoneal dialysis (PD) is a treatment for kidney disease that uses the patient's stomach peritoneum. A machine called a Cycler, forces a cleansing fluid through an abdominal catheter and flushes out the fluid every night while the patient sleeps. The medical community calls this process continuous cycling peritoneal dialysis (CCPD). Note I also included a BPMN choreography between the Patient and the Cycler. When I modeled the peritoneal dialysis process, my focus was on the patient process. Therefore, I only developed processes for the first three pools. In BPMN, modelers call these pools with orchestrations (internal processes) – white box pools; this is similar to white box testing in software (i.e., the software developer knows the code pattern that allows for thorough testing). The same parallel goes for black box pools (i.e., in black box testing, the end-user only knows the input and expected output). As a result, I modeled the pool, “Ship Dialysis Equipment”, as a black box with no orchestration. This pool covered the process of the Dialysis Equipment Supplier; the equipment consists of cleansing fluid bags plus other medical needs . However, after a year of flawless operation, the supplier started missing scheduled deliveries; obviously, this is life critical – no cleansing fluid, no dialysis. With the lack of cleansing fluid being delivered, I am now motivated to model the supplier process (i.e., the black box pool). I need to model the shipping process, conduct a root cause analysis [2,3] and determine corrective action. The problem could be rooted in materials, quality, resources, distribution process or something else. Essentially, I need to change the Ship Dialysis Equipment black box pool to a white box pool with orchestrations. Prior to my analysis, I received a formal communication from the supplier. Their root cause for the problem was due to inadequate internal resources for distributing their products including cleansing fluid. Their short-term corrective action was to expand their distribution process to include two carrier partners. This means that the Ship Dialysis Equipment pool now has new collaborations (messages between pools) with “carrier” pools. Below is the revised BPMN model (Figure 2) based on the supplier’s communication. As you can see, I have added to the Ship Dialysis Equipment pool an orchestration; it’s no longer just a black box pool. In addition, I placed two collaborations between the Ship Dialysis Equipment pool with two carrier pools: Carrier One and Carrier Two. Note that I chose to represent the carrier pools as black boxes without orchestrations leaving them for possible follow-on analysis. Since the addition of external carriers, the supplier has been able to meet their commitments. In general, you only need to model the current business (AS-IS) to the extent that you need to understand the business. The vision (TO-BE) model, of course, needs to include the detail to reflect the impact of changes. Best Practice: create white box pools with orchestrations per your scope, but keep the black box pools in the model. Your initial focus may be on certain orchestrations; however, future events may cause you to expand your scope into these black box pools. Assuming you read the reference , I thought I would provide an update on my wife’s condition concerning dialysis. Great news, her kidney function is coming back! This past year her doctor reduced her dialysis treatments from 5 to 3 days/week due to her progress and recently her lab results indicate that she may be able to drop treatments in 2015. Wow! Ishikawa, Kaoru (1985) [First published in Japanese 1981]. What is Total Quality Control? The Japanese Way, New Jersey: Prentice Hall.